This page contains information about different topics related to advocating for the best possible education opportunities for our children. While much of it relates to legislation (current or pending) it also relates to grassroots movements, court cases, and ballot initiatives that may impact our schools. This page contains many links to outside sources you can use to gain more information, with some overview of a PTA position (PV, Jeffco, Colorado or National) on the issue presented. You May Ask Yourself: How Did I Get Here? 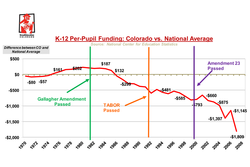 If you click on the graphic to the left, it will take you to a 2011 article on Great Education Colorado's website discussing the decline in per pupil funding in Colorado from 1972-2009 (as compared to the national average).